If you've noticed water on the floor under your water tank, start preparing to have it replaced. I know this may not be what you're hoping to hear but I don't suppose you've searched on this topic to hear lies. The fact of the matter is, if your tank itself is leaking, repairing it is not an option. 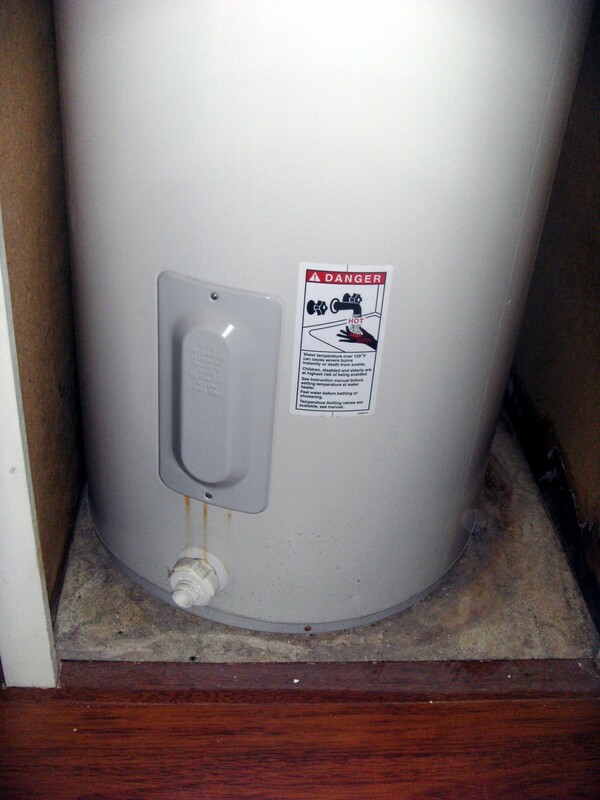 A hot water tank is a sealed unit that even if repairing a leak to the tank itself was an option, it would likely cost you more than a replacement tank that would at least have a new warranty. Just because there is water on the floor doesn't mean your tank is shot so before we call for the estimates, let's make sure of where the leak is coming from. There are many sources of leaks when it comes to your hot water system and you surely want to know if it's something more simple than replacing the unit. Here are a few things you'll want to check before condemning the unit to the scrapyard. Check all the plumbing connections coming to and from the unit for leaks. Check to see that your T&P valve isn't the culprit. Is there sweat all over the outer shell that could be dripping to the floor? Is your unit new? This could be normal. 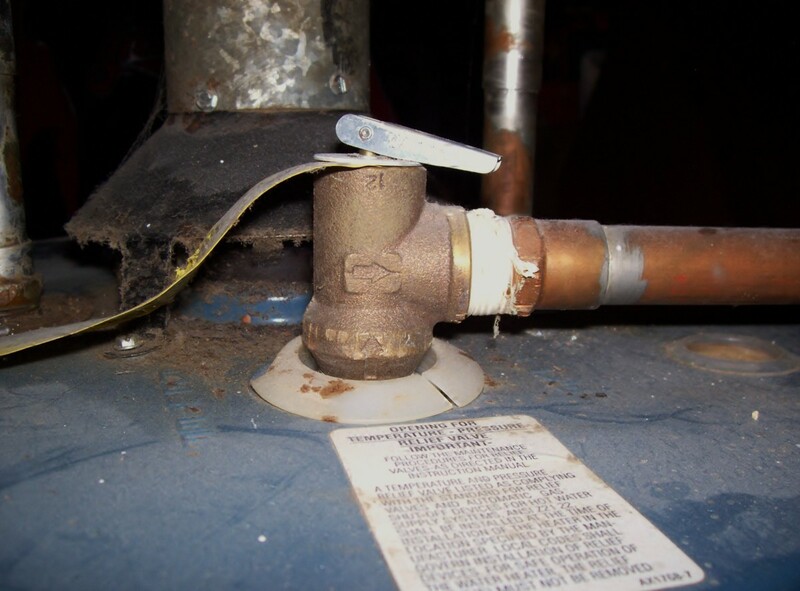 If you locate the source of your leak and it seems to be a connection rather than the tank, you may be able to fix this yourself. Some of your connections may be threaded fittings that perhaps need a new seal. A simple new application of Teflon tape may be all that is needed. Of course, there are those pesky soldered fittings that leak and many people aren't capable of re-soldering these parts. Well, rest easy my friend. For those of us who hate soldering or are not capable of doing so, I introduce to you the push fitting. These fittings may just be the best thing since the Bite-Sized Mini-Wheat. There are many brands of push fittings. I've worked with SharkBite and Souix Chief myself and not had problems with either. These fittings simply push on and in my experience, they are worth every penny more than the solder fittings. Did I mention they can be removed too? How about spun once they are installed? Yes, these are one of my favorite inventions in the realm of home improvement in a long, long time. Sure, there are some who don't like them but I've never had a problem with mine and believe that those who have either didn't install them properly or are losing money to the homeowner who is no longer running away from reworking their own plumbing. Either way, if you found the leak to be a connection, you are lucky and should be able to repair it without any major expense. 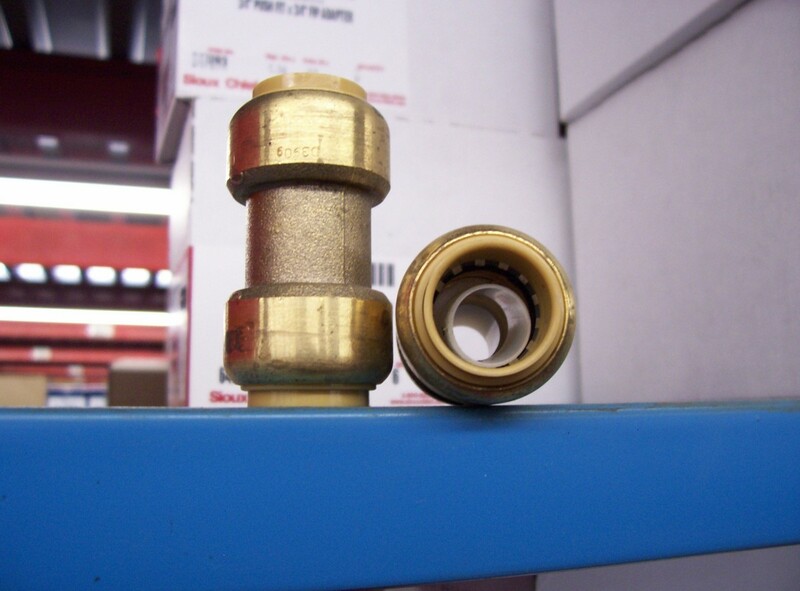 Here's an example of a braided water heating connector with a SharkBite fitting. The water heater hoses are a common place to find a leak. Though it is possible to see your water tank sweat, it's not nearly as common as a malfunctioning T&P valve. This valve is to release pressure from the inside of the tank should it reach a dangerous level due to overheating. Checking and replacing this valve is not all that difficult. Finding the correct valve and draining off the tank is more time consuming than actually replacing the valve. In my years of working on water tanks I've learned to always warn the homeowner that if they notice water or dampness on the floor in the first day or two of installation, it is more than likely normal. 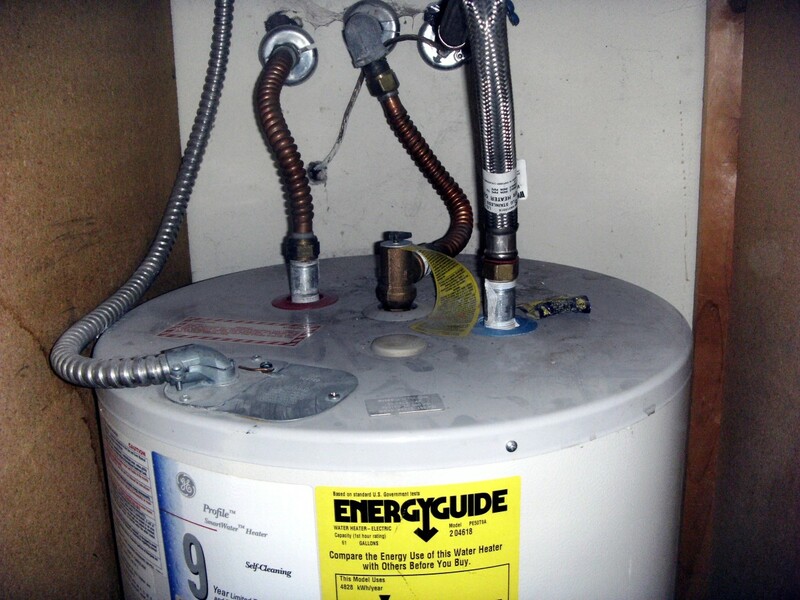 When a water heater sits in storage waiting to find it's new home, it collects humidity in the insulated lining. Once the tank is installed, filled and heated up, this humidity is often released. Of course, gravity pulls it all to the floor and leads the new owner to believe they've been sold a bad tank. Now if there is still water or dampness after a couple of days, you may be right and the tank may very well be bad. As inconvenient as it is, it does happen and may very well be no fault of the installer. 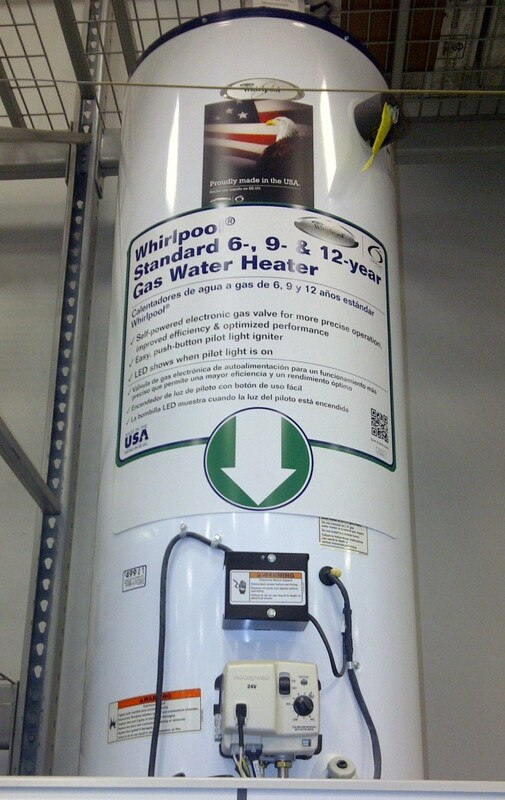 Most water heaters these days carry with them a 6 year warranty. You may be able to purchase an extended warranty from your installation company and if it's reasonable, I would consider it a sound purchase. So you feel that it's the tank itself that is leaking now that you've done your inspection. For starters, consider directing the path of the leaking water toward a drain as to contain the mess it's likely making. Also, turn down the temperature on the tank. In some cases where there is a smaller leak, the temperature being too high can increase the amount of water you're losing through the leak in a given time. 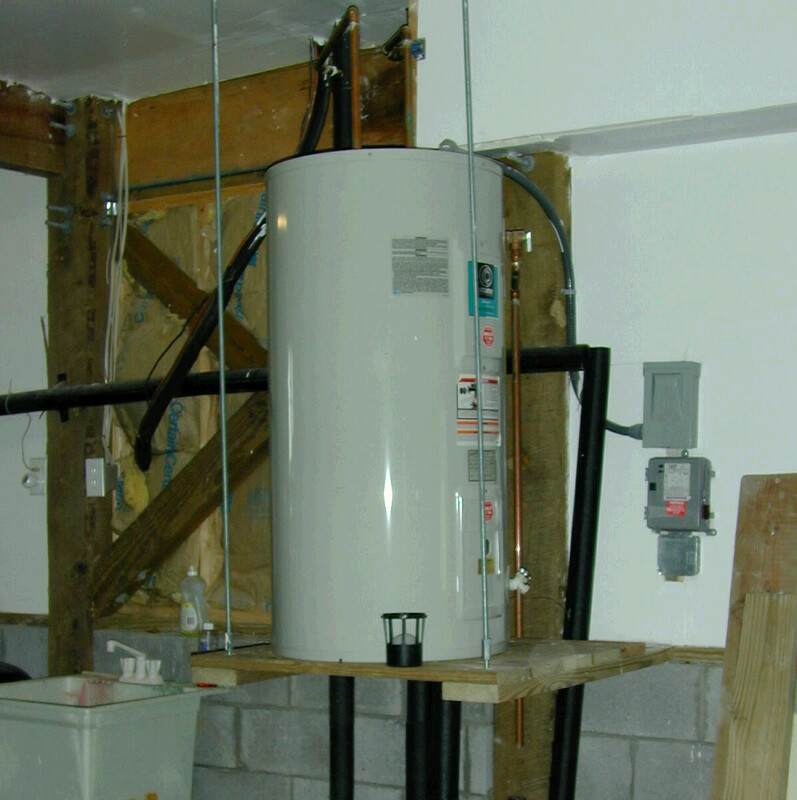 In all reality, replacing a water tank is rather simple and many homeowners do choose to do this improvement themselves. Though I won't be explaining how to do this here, it is something you may want to consider if you are mechanically inclined. The concern here is the gas or electricity that is involved in heating your tank. Do not try to replace your own water tank if you are not familiar working with these energy sources as either one can spell disaster if not done properly and safely. Are you confident enough to perform many household repairs yourself? Oh yeah. Bring it on! Ummm, what's a water heater? For those who won't be trying to tackle this on your own, the cost of having it done is bearable in most cases but not nearly as cheap as it once was. Since going the way of sealed combustion as opposed to the old open chamber burner assemblies, the $150, 40 gallon water tank no longer exists. These days, if you find a standard size water heater for $450, you're doing pretty good. As for installation costs, they're not usually too extensive. The plumbing industry has kept their cost to do a water tank replacement fairly reasonable to keep too many homeowners from doing their own tanks. If you are being charged any more than $800 - $1000 for a standard water heater replacement, I'd say you need to keep shopping around. Considering the following items can help you to extend the life of your water tank as well as keep it operating at its maximum efficiency. The anode rod is a sacrificial lamb so to speak. This aluminum or magnesium rod is inserted into the tank to attract corrosive types of chemicals that are in the water. These chemicals and minerals are attracted to the rod where they can feast on it as much as they like instead of the walls of your water tank. If this rod has been eaten in your tank, the next smorgasbord will be your tank itself. My hot water tank has been turned off for three weeks as I am away. Upon returning home, I notice some water in the bottom of the drain pan. What does this indicate? I would never turn it off. Only down or to vacation mode. It may just be sweat. If the water goes away and stops in a day or two, it probably is. If not, you have a slow leak that will only get worse. Thank you Suplumb Nick. I welcome good suggestions. 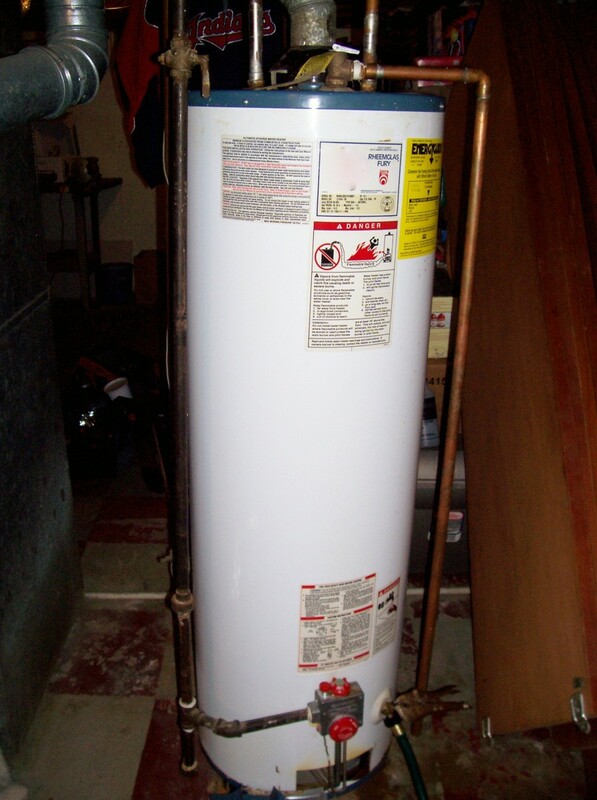 To extend the life of your water heater, you can also install a water heater thermal expansion tank, which will protect your tank better. And better to install a water heater pan under water heater, in case any unexpected water leak to ruin your floor. Carol K - It depends if it's just a gasket or corrosion at the seal of the gasket. If the gasket has failed around the temperature/pressure relief valve then it may be as simple as replacing it or re-taping the threads on it. If the tank itself is corroded around the valve then replacing the tank is really the only logical option. It's not a do-it-yourself project if you're not familiar with draining the tank to make the repair or you could be sprayed with extremely hot water. The hot water heater is at 10 year mark and I’m thinking it needs to be replaced. I'm going to say no but there are some details that aren't clear in your question. Elements can be replaced. Elements can leak due to corrosion at the seals however an element going bad in and of itself will not cause a tank to leak. I hope that helps. Hi Jenifer. Well the wood structure should still be fine so long as it's good and dry before sealing it back up. Hopefully you now have a drain pan under the water heater that will catch and drain away any future leaks if need be. Aside from that, you should just be looking at drywall repair. If you want to go the extra mile, I suppose you could use "green board" as opposed to standard drywall but the main thing is to be sure that the area is thoroughly dry before closing up. Mold is the worst thing that can happen now if sealed up while still damp. It's difficult without an image to see if I'm overlooking something. Feel free to contact me via email and thank you for reading. Our hot water heater is in the attic and the floor it sits on is the ceiling in my husbands closet. My concern is the floor it sits on is exposed in my husbands closet. We had a really bad leak but all is fixed in the hot water area. We need to replace that floor which is the ceiling. How do we do this safely and correctly? Please advise. I bought some of those push fittings and I think they are the best. Thanks again for the great advise. Voted up! Unfortunately, if it's leaking, it's time. There's no way to determine exactly when it will go completely and I would say, yes, it will probably leak more as a "sign" that it's getting worse but I wouldn't rely on that. The cost if it does go can be much more if there is water damage. I would just say do it as soon as you can. My water heated started leaking the past few days very slightly, the drain tube has maybe a 3 inch wet spot, it doesn't leak enough to grow anymore than that. I can't tell where it is leaking from so I assume it is the body somewhere on the bottom since I can't see there. Is there any good way to tell how urgent it is to replace it? I want to get it done but of course Christmas is a couple weeks away and spending 500-700 dollars isn't really in the budget right now. Just not sure if I should chance it and wait a little bit or not. Is there not a good way to tell how bad it is if you can't see it? Ahh a homeowners worst nightmare (next to the sump pump going). Definitely a boatload of information, thanks so much! Very timely...I think. :) I just had to replace my water heater this morning because last night it sprung a leak at both the top and bottom and flooded my utility room. I googled "How to fix a leaking water heater" and found the information I needed but it took some digging and reading. Your hub was right to the point and would have saved me a headache or two last night if I had found this. Next time I will remember to come on HubPages when I have a question BEFORE searching Google! Great information. Very easy to follow. Great information. Yes more useful household tips from the master. You have much to be proud of in all of this work. What I'm particularly impressed by is how you can take technical things and make them simple--great writing skill there. Voted up, useful, and pinned. Quality and useful information. Voted up! Very informative hub. I've learned some useful information. This is a good one to use in future and I pinned it. Thank you. I am in need of a new water heater and this information is very useful to me. DIY is always cheaper when you know what the problem is and what to do about it. I save a lot by fixing things at home. @cyoung - Wow! I'm curious as to who your suppliers are where ever you are. I work for a supplier and we stock power vents by the truckload. Sorry you had issues but thank you very much for stopping in. @everyone - I know how cheesy it may sound but I am so grateful for all of your support. My aim is to help homeowners understand their home equipment and perhaps avoid any unnecessary costs during these tough times. I am so glad I'm able to help where I can. No "S" on my chest but wanting to do what I can to pay forward kindnesses that have been given me. I just replaced my water heater and it was a job in a half as the old one was a power venting system. not many people carry that type of water heater and to top it all off it was a Sunday afternoon. I had to replace it with a normal system and had to re-vent the system as the power venting system used PVC pipe. Oh well, since I have a dual heater system I'm just waiting for the other to go out now. Great info...voted up and useful. Great Hub. Thanks for sharing it. Voted up! Congratulations on Hub of the day award. You are always so thorough and that is what I enjoy about your hubs. I always learn something new and valuable. Like, I never knew that the life of my water heater would increase if I drained it once a year. I have never drained my water heater. But, now that I know why it is a good idea to do so, I'm going to start draining my water heater once a year. I should say, I'm going to ask my husband to drain it and replace the anode rod. Thank you for your excellent advice. Oh, by the way, congratulations on receiving Hub of the Day! Thanks for sharing the info. You forgot one source of leak, the drain valve may not be completely close sometimes. Sometimes a slow drip will occur here. Congrats on the HOTD! So deserved!!!! Sharing, so others can learn from it! Very interesting read. You have such a vast knowledge on this topic. We recently changed our water heating unit. Not because of the leaks, just cause it's been over 10yrs old and we needed a bigger one. Thanks for sharing, and congrats on winning the HOTD award. cre8tor - Congratulations on Hub of the Day. I've recommended your hubs to a few homeowners because they all are so helpful given your HVAC expertise and this hub is a perfect example. We recently had a leaky water heater replaced and I wish I had all this information to read at the time. Very, very useful! @TF - Thank you kindly! and I wish I was half as educated as you. Perhaps we are the Yings to Yangs?! I wish I was half as practical as you. Another great guide! Voted up and very useful! Wow, another incredibly useful guide! Your Hubs are the best, Cre8tor. I don't know how folks become knowledgeable about things like water heaters and air conditioners, but I'm so thankful that you create these Hubs. I don't know where else I'd end up knowing what to do should my water heater start leaking! In the end, I'll probably still end up asking for help, but it's great to have a more fundamental and basic understanding of what to look for, what to do, and how to do it. Great information. Like Daughter of Maat says informative with useful pictures! Oh, I need this one! Along with my aging AC, the hot water tank is easily 18 years old. Both are originals. I get overwhelmed when I go to the store and see the choices (I'd love tips on how to pick the right unit!). Thanks for this information; I'd better start checking the sales in today's paper. Full of useful information as ever! Again, I thank you. 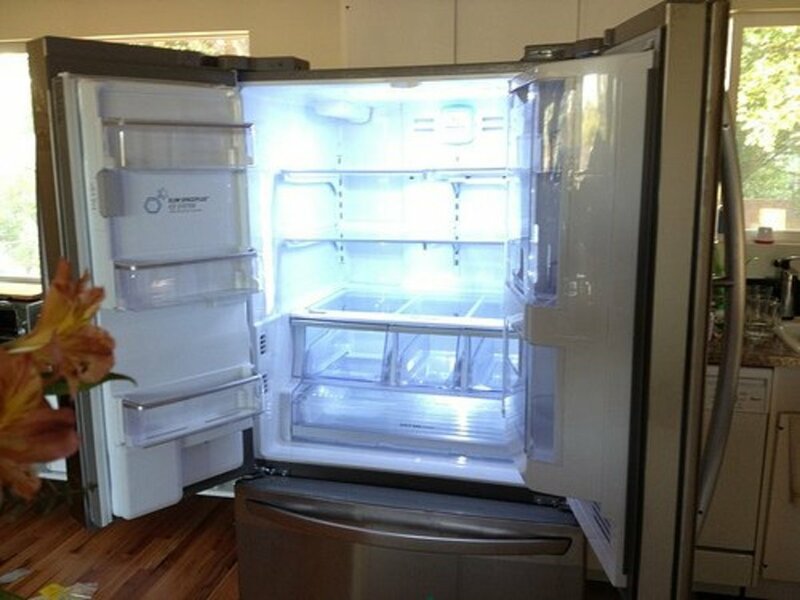 I am looking to move on to some other appliances and tips for homeowners so I hope they to will prove to be useful. I absolutely love your hubs. They are so informative, and the pictures make it so easy to understand what you're talking about. This was another one of those things I needed to know, so again THANK YOU!!! Voted up, useful, awesome, and interesting, and of course shared!